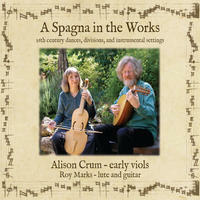 Alison Crum and Roy Marks: Ethereal, enigmatic and exhilarating renaissance miniature masterpieces for viol and lute. 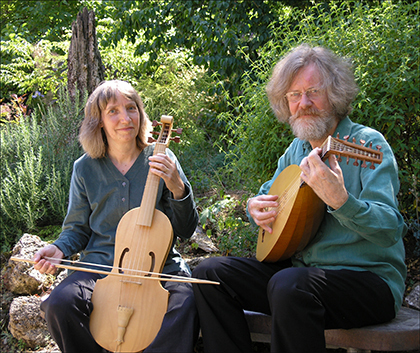 Alison Crum is well-known throughout the Western World both as a player and teacher of the viol. As well as her recording of the Bach Gamba Sonatas with Laurence Cummings, she has made around one hundred recordings with some of Britain's finest early music groups, including The Consort of Musicke, The Taverner Players, The King's Consort, and many with the Rose Consort of Viols. She is President of the Viola da Gamba Society of Great Britain, Professor of Viol at Trinity Laban Conservatoire of Music and Dance in London, and a visiting teacher at several colleges and universities both in Europe and the USA. Alison is the author of two highly acclaimed books on playing the viol, and has been called the doyenne of British viol teachers, directing numerous summer schools and workshops worldwide. You can find out more about Alison on her website. Roy Marks is Alison's husband. More widely interested in the Arts than his wife, he studied the piano as a child in the 50s, played lead guitar in a pop group in the 60s, studied at art school (graduating from the Royal Academy in London in 1975 where he studied painting and drawing), and in the early 80s studied classical guitar at the Guildhall in London. He taught painting and drawing for a number of years, but in 1984 turned his attention almost exclusively to early music - to the recorder, the viol, and later, the lute. He performs with the Rose Consort of Viols, regularly teaches on workshops in England, Germany, Italy, and the U.S.A., and composes music for period instruments. Alison Crum and Roy Marks lives in London, England. Tagged as: Classical, Renaissance, Instrumental, Composer: Diego Ortiz, Composer: Francisco de la Torre, Composer: Riccardo Rognoni, Lute, Viola da Gamba.